Sometimes a scene recommends itself for special and unusual treatment. With most of our work, we strive for exceptional beauty or an exceptional mood that enhances the meaning of the image. Still, sometimes an image evokes the need to leap beyond the usual constraints into abstract art and unusual visions of reality. These scenes are always real, sometimes hyper-real. and they have been taken to the level of a dream. We've been very sparing in this gallery. Dreams are the hardest images to capture and we've selected only the best. Take a deep breath, and then take a close look. Later, be sure and check our other galleries as well; they overlap a little. For your convenience, we've placed only a few images on each page of this gallery. When you are ready, go back to page 1 or 2 of this Gallery, or use the tags at the top to view other galleries on our site and place your order. Old Tucson© requires a little imagination. Here is a movie set that mirrors the mind’s picture of early 19th century Tucson. 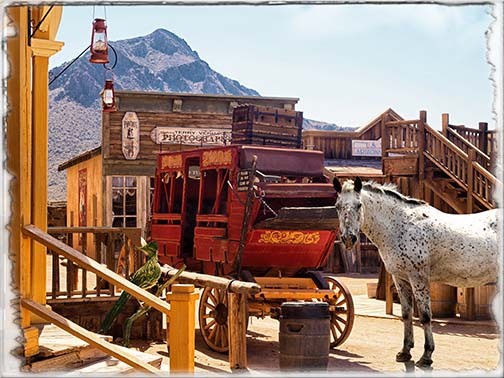 Surely there was a regular stage coach line running to Bisbee, Nogales, and Yuma, a post office and, by the middle of the century, a fair share of watering holes. The horse and road runner are residents of the 21st century, but surely related to those who came before. On the Wing©. Evening is the time when the desert begins to cool and life often seems to begin again. Here, the remains of an old saguaro reach their tendrils into the sunset sky. 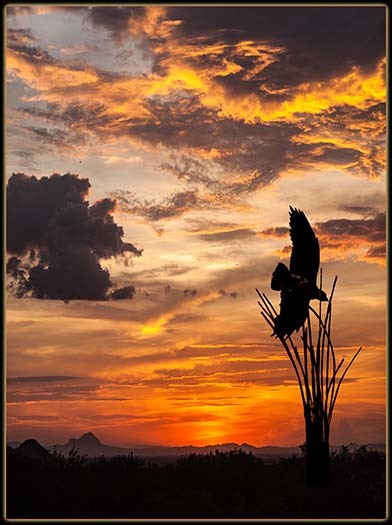 Then, suddenly, with just the whisper of wind, a hawk passes by, on its way toward some unsuspecting rabbit or mouse. Poker Face©. Does he have the winning card? Maybe it’s the one up his sleeve. On the other hand, the bottle and the sort of clever grin suggest this might be a bluff. Quick! Call his bluff before he falls back to asleep. Pueblo Living©. The Taos Pueblo is a living relic of the Taos Reservation. Some tribal members live elsewhere, but a number of them choose to live as their forefathers did for centuries before. The residents still practice their ancient skills as well, such as weaving and ranching. Perhaps the most important skill is learning how to maintain the adobe structures themselves. Rising from the Desert©. 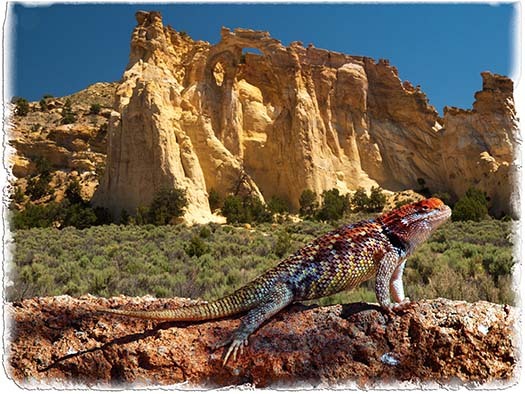 Grosvenor Arch in the Grand Staircase National Monument provides an incredible backdrop for this little lizard. The guy is decked out in his spring colors hoping to impress a mate with his beauty—and of course with his ability to do his pushups on the top of the volcanic rock. Too Close©. Imagine yourself in the cave looking out. Someone is looking in, back at you. What is it? This powerful creature is an Arizona mountain lion. For now, she is relaxing on the boulder and it doesn’t seem that she sees you. You are safe, but still this is a little too close. Better back up now!